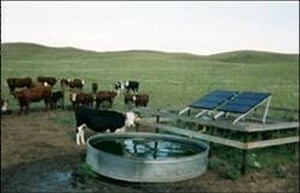 For livestock producers and many other applications, "solar" and "water pumping" go together as well as pigs and mud! If you have a well you're not using and need to expand your pasture's horizons, call us with your well specifications, as well as the number of cow-calf pairs you're watering. We'll let you know what it will take to keep your thirsty cows happy. If you have need of a residential water system, let us know what kind of pump you have in place now, how much water it pumps in terms of gallons-per-minute, and the amount of water you need on a daily basis or weekly basis. We can't design a solar water pumping system without the information requested on our solar water pumping questionnaire. If you don't hear from us in a day or two, give us a call on our Renewable Energy tech support 406 777-4309, or email us. We will reply promptly. We can usually generate a proposal within a day or two of receiving a questionnaire, and a comprehensive and detailed form results in a quicker response from us. Thanks for your interest in solar water pumping systems from Oasis Montana. **Please click here to check out a great article on solar water pumping. A great place to start. Fill out this form so we can determine your water pumping requirements. Please answer all questions so we can get this proposal back to you as quickly as possible. A great solar water pumping primer. Unless you are very familiar with solar water pumping, please start here. Now you can power your soft start AC pump direct off of your solar array with the exciting PICOCELL inverter/controller. This will increase options for those desiring emergency back-up for their water systems, or for our off-grid customers. Need more Horse Power? Check out our new 3 HP PICOCELL controller! The Grundfos line of SQFlex submersible pumps can deliver water efficiently from 400' using solar, wind, or generator power. Lorentz is re-arranging their distributorship and there may be some extended lead times. The Lorentz line of submersible pumps is the most cost-effective way to deliver water from depths up to 760' using solar or generator power. When you need a high volume of water from a shallow water source, look no further than the line of Dankoff SunCentric pumps. This surface pump can draw water from a shallow source (well, spring, pond, river, lake, etc. ), push it as high as 230 feet (~100 psi), and deliver as much as 5,600 gallons per day. Designed to provide city water pressure (up to 65 psi) from a shallow water source using DC battery power or any 115 VAC source. The Slowpumps can draw water from a shallow source (well, spring, lake, river, etc.) and push it as high as 450' vertically and through miles of pipeline. This powerful diaphragm surface pump can draw water from a shallow source (well, spring, lake, river, etc.) and provide as much as 5,400 gallons per day pushing water as high as 960 feet. Shurflo's 9300 Series pumps are backed by 25 years of research and engineering experience. Check out these shallow well/high volume and deep well/low volume example solar water pumping systems featuring the Lorentz solar water pumps. Solar Center Pivot Irrigation System In Saskatchewan, Canada With the cost of photovoltaic power coming down, many farmers, ranchers and other agricultural growers are finding solar pumping to be a cost effective method of providing adequate water for their crops or livestock. Oasis Montana is a proud member of the Montana Renewable Energy Association. Click on the logo to visit their site. If you would like to read our solar water pumping page in Romanian click on the link below.